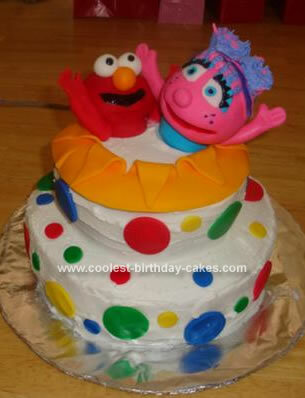 This Elmo And Abby Birthday Cake was my FIRST time EVER making a cake. I wanted my little girl’s 2nd birthday to be special, and the theme was Elmo and Abby. This is the cake I imagined. I did lots of research on making cakes through various websites, this one included. I made store bought box mix, and used a Walmart cake leveler to make them all level. I used a homemade butter cream icing a friend gave me, perfected it and went from there, used store bought fondant and played for 2 weeks making the characters. It was a lot of stress for me, but I am very pleased with the end result, seeing as I had NEVER done this before. This is absolutely awesome and I know you must have been so proud of this accomplishment Great Job! You did a wonderful job on your cake!! I took a couple classes on cake decorating with a girlfriend of mine about 20 years ago, so, I do okay with buttercream icing. My daughter wants me to do a birthday cake for her son, my grandson, in fondant icing this month, and I’ve NEVER done fondant icing before. So, I’m finding myself in the same boat as you were. I have no idea how to do this, so, I went out and bought some supplies to practice with. She sent me some pics of some Elmo cakes that she would like me to pick from; they’re 2 or 3 tiers. I figure that if I mess up too much with the first layer of the fondant, then I can cover up the goofs with cut out shapes and letters and stuff…..I’m sure you’re a whole lot more comfortable with your work with cakes now, and you’re probably looking for a reason to do another one?